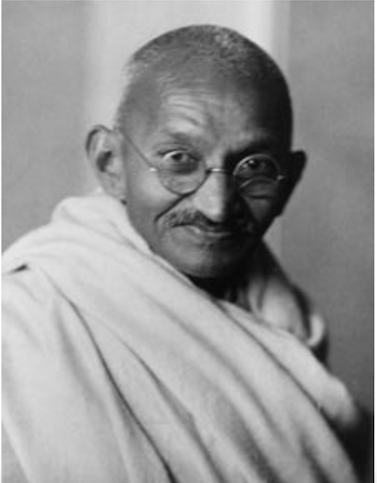 IT ALL BEGAN IN NEW DELHI INDIA WHEN THE MOVIE GANDHI PREMIERED IN 1982 . IT WAS AN AWAKENING TO SEE TRUTH AND NON-VIOLENCE PUT INTO ACTION. THE MAHATMA WAS SHOWING US AN ANCIENT WAY TO LIVE AND WORK FOR A MORE PEACEFUL WORLD THROUGH VILLAGE LIFE. TODAY WE HAVE OVER 200 SPINNERS SPINNING FOR KHADI OAXACA. TWICE A MONTH WE RECEIVE THE SPUN THREAD AND THE WOMEN RECEIVE THEIR PAY.